Eric Ripert and Anthony Bourdain are good friends. They hang in the same circle of foodies, often known as a chef mafia, and have appeared on numerous cooking shows together. But Ripert says he has to draw a line somewhere -- like at the entrance to his world-famous Le Bernardin restaurant in New York City. It takes only a second for Ripert to ponder the idea of the surly, foul-mouthed rebel host of "No Reservations" working in his kitchen. "No," Ripert said with a chuckle. "We're good friends and it wouldn't work. It's not good to work with friends." Whether Ripert would be more scared of a friendship coming to an end, or the potential destruction of his restaurant empire is hard to tell. That's what you get when you're dealing with Bourdain. He's likeable, extremely outgoing and is quick with a good-hearted joke. But you just never know what he's going to say or do next. It's that unknown that will draw many to the Warner Theatre Friday night as the culinary duo sit down for a discussion about everything food. Bourdain, known for his sharp New York wit and sharper New York tongue on his Travel Channel show, seems an unlikely match for Ripert, a Zen-like French-trained chef who seems to say and do everything the perfect way -- the way he was trained by the culinary masters abroad. The two make no secrets about their different backgrounds. Bourdain likens their relationship to the Odd Couple. 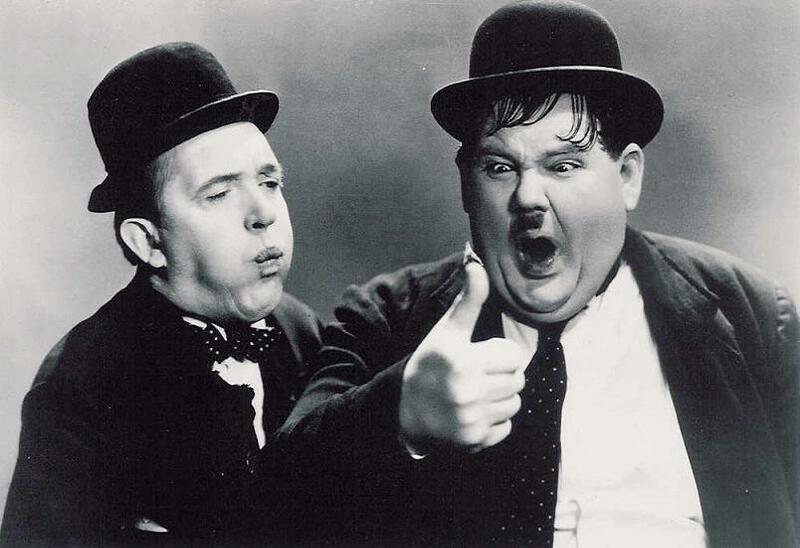 Ripert says it's more like Laurel and Hardy. "Part of the fun is he has a reputation to protect instead of me," Bourdain said. "I always feel like I'm getting him into trouble." Bourdain often comes across as the bad boy of the food world -- if there can be such a thing. It started with his tell-all book about his time in the NYC restaurant scene and continues today with his critically acclaimed TV show. It's a show that is coming up on its 100th episode, and one that remains just as unpredictable now as it was when it started. Getting trapped in Beirut as a war breaks out? Been there. Watching a flamboyant Chinese man sing patriotic military songs while wearing a cowboy hat and playing bongos? Done that. Burning six tons of cocaine in Panama? No problem. Bourdain says he and his crew try to plan as much as they can before filming an episode. But sometimes the best stuff just happens. "We just shot a scene in Europe where an insane fight broke out at another table," he said. "It became this giant confrontation. It was a spontaneous outburst over "How come my pasta is not here?" It looked fantastic. "We don't over plan," Bourdain said. "We let the restaurant owner know we're coming. But if things go wrong, we shoot it going wrong or we go to Plan B as best we can." Ripert, on the other hand, seems to enjoy the calmness and tranquility of Avec Eric, his cooking/travel show on public television. He has one season under his belt, and is looking forward to another -- which will include an episode based in different parts of Virginia. His war stories aren't as extensive, but he's had his moments. "Being charged by a wild boar was kind of like Beirut," Ripert said with a laugh. Unlike Bourdain in his return to Lebanon's capital city, Ripert isn't ready for another round with that freaky creature in his second season of filming Avec Eric. "I'm not going back after the wild boar, I'll tell you that," Ripert said. The wild boar story surely will come up Friday night when the pair talks in D.C. It's a town both know very well. The District was Ripert's first home in America. He joined the cooking staff of the famous restaurant at the Watergate Hotel in 1989, despite not knowing a lick of English. And even though chef Jean-Louis Palladin ran things, French wasn't on the menu in the kitchen. "There were not many French people, and Jean-Louis spoke to me in English on purpose," Ripert said. "It wasn't easy. Thank God I had a sympathetic girlfriend who taught me." Ripert said he took the job in Washington because he was young and he wanted to travel. And being the sous chef for Palladin didn't hurt, either. Yet he took it without knowing much about the nation's capital. "I had no idea what it was," Ripert said. "But it was a beautiful city. I was impressed with its beauty. But I was bothered that it closed at 2 a.m."
Ripert spent about two years in D.C. before moving to New York and joining Le Bernardin. The rest, of course, is culinary history. He earned fame in New York, and then eventually opened another restaurant in D.C. called Westend Bistro. He visits the restaurant about eight times a year. He also recently taped episodes of the reality show Top Chef, where he was a guest judge. Bourdain has taped an episode of No Reservations in D.C. and made the obligatory stop at Ben's Chili Bowl, although he did it with a twist by inviting author George Pelecanos. He's also friends with numerous D.C. chefs, including Michel Richard and the ever-enthusiastic Jose Andres. 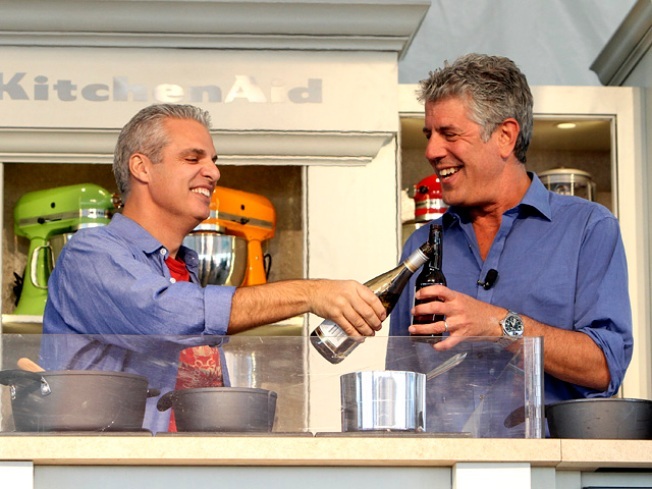 "Over the last decade D.C. has turned into a really exciting food city," Bourdain said. "Other than New York City, I'm trying to think of an eastern seaboard city with the kind of heavyweight chefs represented. I can't think of one." Bourdain gushes over Andres, who owns several D.C. restaurants, including Zaytinya, Oyamel and minibar by jose andres. "Hanging out with him is just fun and fattening," Bourdain said. "There's no one else like him in this world. He's just a good f---ing guy." While many people look to Bourdain as an icon and food hero, he holds others, like Andres, in the same regard. Take his chance encounter with Bill Murray in an episode of No Reservations as an example. Bourdain, you see, is a big Murray fan. And while eating at a restaurant in the Hudson Valley, the owner said he could call up Murray to join him. A short while later, there was Bourdain, eating with one of his idols. The smile on his face in that episode is burned into many a flatscreen TV across the country. "I'm still wondering how that happened," Bourdain said. "Why am I so lucky? I don't get it. I don't know why he did it. ... I'm a total fanboy." It's perhaps because he is that he can still produce quality TV for the masses year after year. His energy shines through -- whether he talking with a celeb or eating pig guts in rural China -- and he seems to be able to go anywhere and do anything, and make it look cool. Just don't let him work in your restaurant. Right, Eric?